So we took that one week off when we were at Disney. And then last week, we woke up on hike day and it was snowing and blowing and cold. Neither of us wanted to deal after a week of fun in the sun. So we went to the gym instead and finished up the workout in the steam room. That’s more like it! Then Kim asked me last night if what the plan was for today. I said we are going — no weather excuses. And it was nice yesterday. Snow was melted off the roads and I got a good run in. However, last night, it snowed again. Man, why can’t we get a good day? I am such a weather baby. 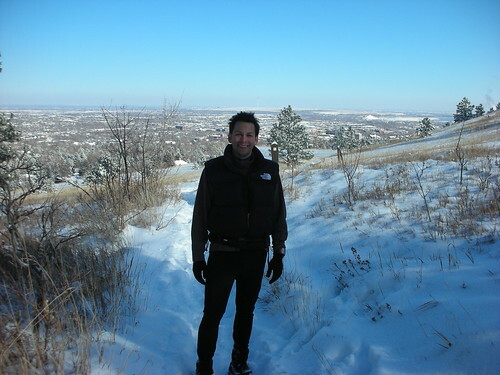 But I was kind of in a funk on Monday so I really needed to get out and get some energy from the hills. We got up this morning and the snow had stopped and it was 20 degrees. 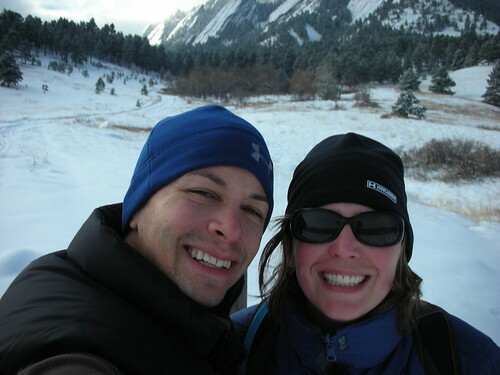 So we got the kids off to school and drove down to Chautauqua for another adventure. The roads getting down there were brutal. It was like they hadn’t plowed yet. Took us an hour. However, we hit Baseline and the road was perfectly clean. A good sign. 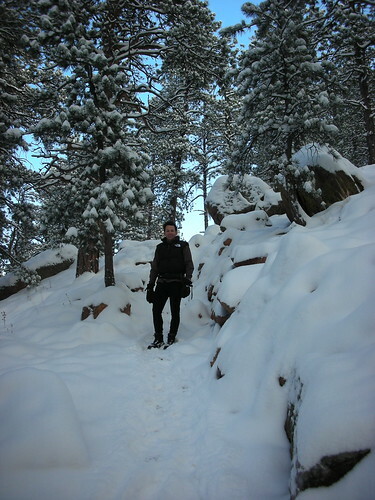 We parked, suited up and hit the trail that was covered in all this white stuff. A little more gear than normal. 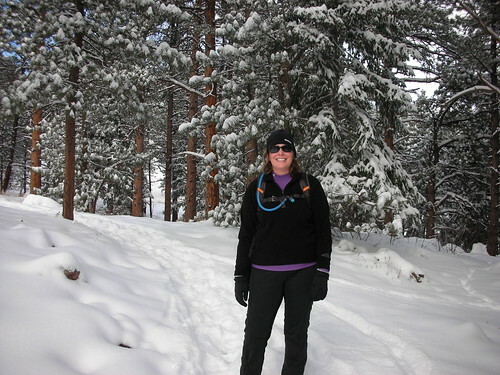 Coats and gloves and snow boots with Yaxtrax were essential. 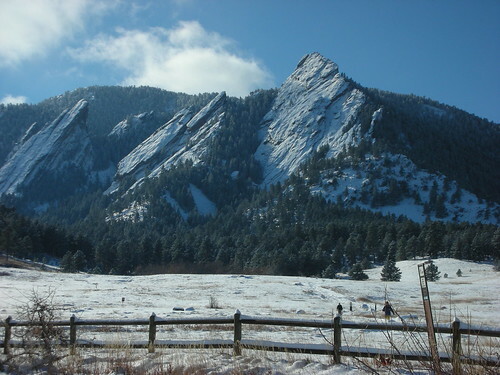 The Flatirons were nicely painted with a fresh coat of powder from last night’s snowfall. What was I worried about? These conditions were perfect out. As we headed up, the gray sky parted and it was blue sky as far as we could see. My partner is still learning her gear selection. So at the top of the first hill, she shed the coat. Too hot! But having fun. The trail was broken for us but it was harder than walking on this trail when it is snow free. We packed Kim’s coat in and headed on. 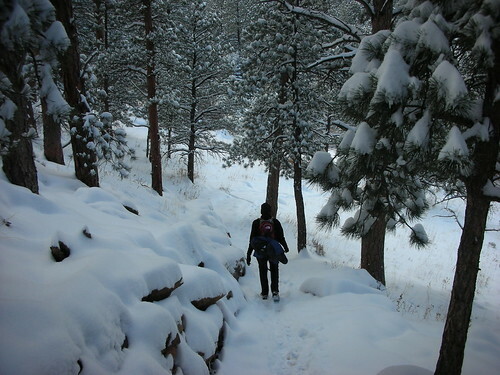 The ups and downs were fun as the steps were covered in snow and you just drifted down them. Sydney told us this morning to give a full report on any animals that we might see. So when I realized we wouldn’t see anything today, I made a paw print in the snow when Kim wasn’t looking. Then tried to play it off on her as a real print. But I failed because it was a single print and I forgot the paw pad. Caught in the act. 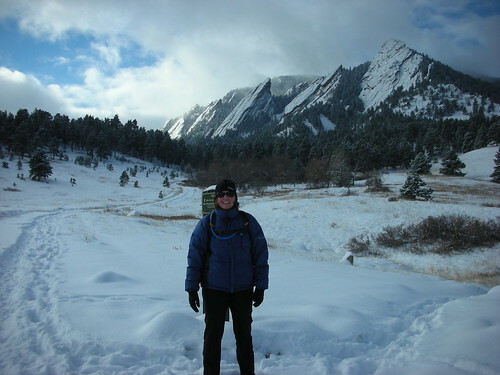 For the Chautauqua boys (JV, GZ), the plan was Chautauqua-Bluebell-Saddle Rock-Amphitheater-Baseline. I figured we had a good shot at that loop for today with the snow slowing us down. The climb up Saddle Rock was starting to get long and the trail wasn’t too obvious. Only a pair of footprints on the track. But we made it to the top and checked our time. We needed to get moving back to the car in order to make kid’s school pickup. Let’s motor down! 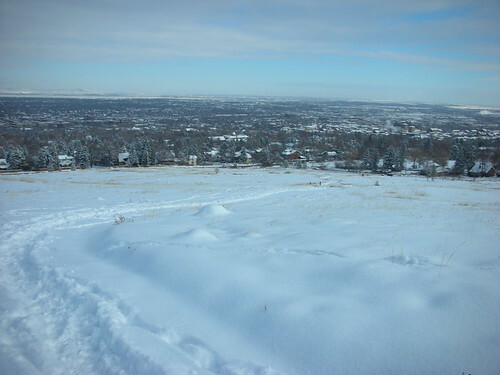 Down Amphitheater was fun as it was all powder — like Steamboat-ish powder! We were quickly over to Baseline and we could relax. Plenty of time left to make it back. Saw a bunch of dogs again. I am going to get my dogs licensed so I can bring them next time. They would have a blast in the snow. However, Kim figures they will freeze to death because they are big babies. My watch said we burnt 292 calories but it is a damn liar. It doesn’t account for the snow! Felt like a good workout when all was said and done. We made it to the car and I turned around for a final shot back up towards the trails. Another great outing with my partner! 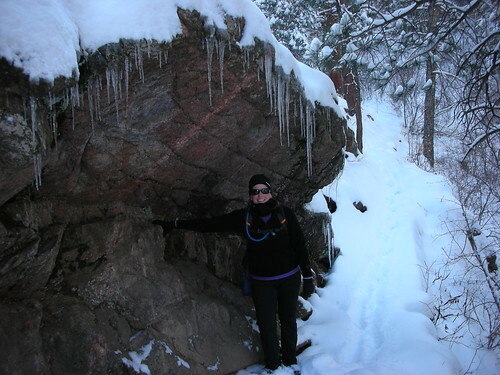 We are both having a great time discovering the trails at Boulder Mountain Park and doing it in all types of weather. Kim never liked hiking in the heat in the middle of summer. So I guess you should be careful what you wish for. However, the snow and her seem to get along nicely. 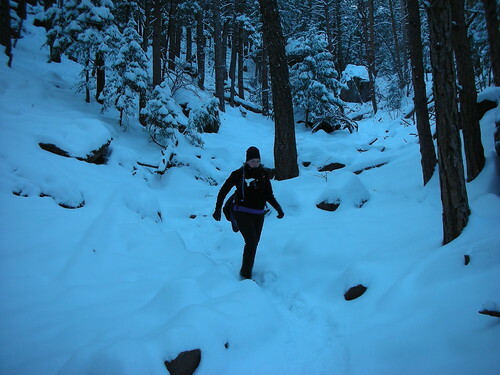 She had her gloves off most of the time and I had my liners with my big Gore-Tex TNF gloves on and I was still tingly!